We Are … in Peru??? Shortly after we shipped the Sept./Oct. issue off to the printer, I took off for a two-week vacation, in the form of a photography workshop in Peru. Most of the time on the trip was spent in the Amazonian rainforest—the Tambopata National Reserve, where we photographed macaws, toucans, frogs, and other critters. But for the last three days, we were based in Cusco, and on one of those three days we made the trip to Machu Picchu. We went to the famed Incan site the easy way: We took a train from Cusco to the town of Aguascalientes, then rode a bus up the mountain to the site. There was definitely a bit of uphill walking after the bus dropped us off, and the altitude (about 8,000 feet) had me huffing and puffing. But it was nothing compared to the trek the die-hards make on the Inca Trail, a roughly four-day, 26-mile hike with elevations of more than 13,000 feet in some places. We saw a lot of the trekkers in Aguascalientes, and some of them were in our train car back to Cusco. On that ride back, one of the other photographers on the trip asked me if I had seen the guy with the Penn State sweatpants on. I had not! So I immediately took a walk up the train car, found the guy, and asked him the obvious yet dumb question: “Did you go to Penn State?” The answer: He had, and so had his travel partner in the seat next to him. 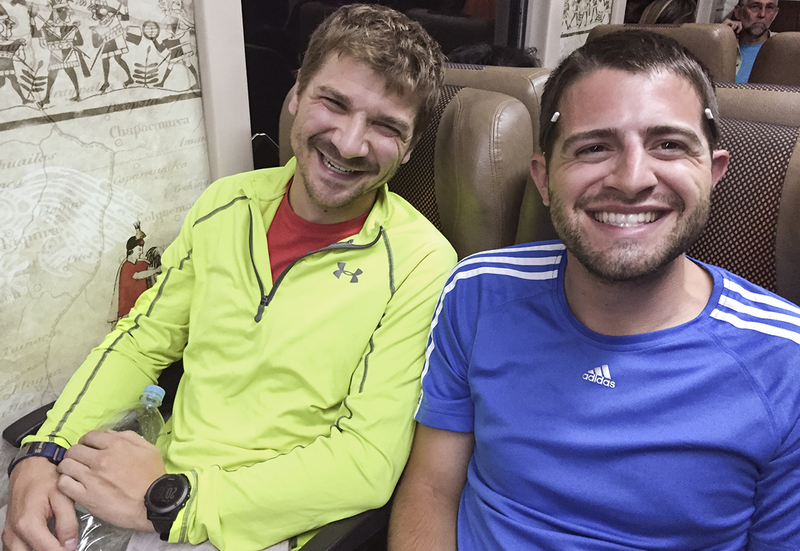 The pair, who have known each other since they were kids in the Lehigh Valley, were on their way back to Cusco after completing the four-day hike to Machu Picchu. I asked them how they were feeling, and they said, “Tired.” But to me, they looked great for a couple of guys who had just finished one of the top treks in the world. Entry filed under: Alumni. Tags: "Machu Picchu" "Inca Trail" Peru. ’74) and I took that same ride last September. What an awesome place Peru is. Nice people, stunning vistas, and amazing history.